Host Francesca Rheannon talks with food writer Betsy Block about THE DINNER DIARIES: Raising Whole Wheat Kids in a White Bread World . Funny and informative, it chronicles how Block got her family –even the pickiest eaters to change their eating habits. And Dr. John La Puma, AKA ChefMD, tells us how the most delicious meals can be good medicine for our bodies. His book is CHEF MD’S BIG BOOK OF CULINARY MEDICINE: A Food Lover’s Road Map to Losing Weight, Preventing Disease, and Getting Really Healthy. Australis (The Better Fish) (barramundi fish farming). Environmental Defense Fund’s Seafood Selector. 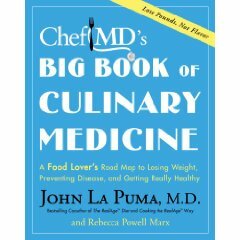 And Dr. John La Puma, AKA ChefMD, tells us how the most delicious meals can be good medicine for our bodies. His book is CHEF MD’S BIG BOOK OF CULINARY MEDICINE: A Food Lover’s Road Map to Losing Weight, Preventing Disease, and Getting Really Healthy.